Loved Casa Sanchez and Santa Fe. Everyone was very nice and very welcoming. We would come back another time. 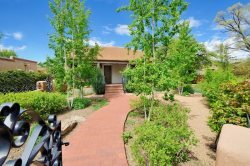 Having had less than stellar results from other agencies, we are delighted to have had Casas de Santa Fe recommended to us by a local realtor-friend. Our experience working with the staff exceeded our expectations. Amelia was genuinely interested in helping us find the right property for our needs. The staff seems cohesive, capable and committed to making each vacation rental experience positive and enjoyable from beginning to end. We are very impressed with the relaxed yet efficient atmosphere at Casas. We truly enjoyed our experience. We love 38M at the Villas at Bishops Lodge. It is beautifully situated for views as well as amenities. The location is just minutes from Santa Fe, yet offers the quiet & ambiance of the countryside. The villa is comfortable and beautifully appointed, the use of space well-thought out. Overall, we thoroughly enjoyed our time there and will certainly consider a return visit. Everyone was very friendly and helpful. I didnt have any problems during our stay, but my only request for service was dealt with quickly and resolved with no issue. This is an amazing property that lives up to its name. The views are stunning and it was truly wonderful to wake up to them every day. The property is well appointed with everything you need while you are visiting. We particularly liked the outdoor seating areas for both eating and relaxing. Would definitely consider returning here the next time we visit Santa Fe. Excellent experience with everyone in the reservation process, checking in and during our stay. Wonderful home beautifully furnished and decorated. We loved every minute!